3 cups of all-purpose flour, plus more for shaping. In a large bowl whisk flour, salt and yeast until well mixed. Pour in warm water ad use wooden spoon to stir until shaggy dough forms. The mixture will be wet and very sticky to the touch. Cover the bowl tightly with plastic wrap and set aside in a warm place for 8-18 hours until dough rises, bubbles and fattens on top. Heat oven to 450 degrees. Once oven is preheated, place Bruntmor's Dutch Oven (with lid) in the oven for 30 minutes before baking. Punch the dough. Generously flour a sheet of parchment paper; transfer dough to parchment paper and, with floured hands, quickly shape into a ball. Place dough on parchment paper and sprinkle top lightly with flour. Top with a sheet of plastic wrap and let rest for 30 minutes. Remove the dutch oven from the oven. 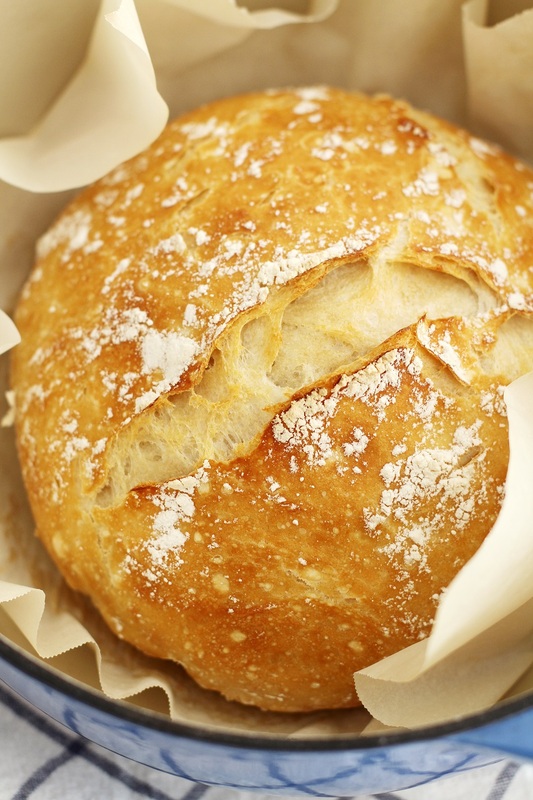 Uncover dough and carefully transfer to dutch oven with or without parchment paper beneath. Cover dutch oven and return to oven. Bake bread for 45 minutes, then another 10-15 minutes uncovered until the dough is baked through and golden brown on top. Cool slightly before slicing.